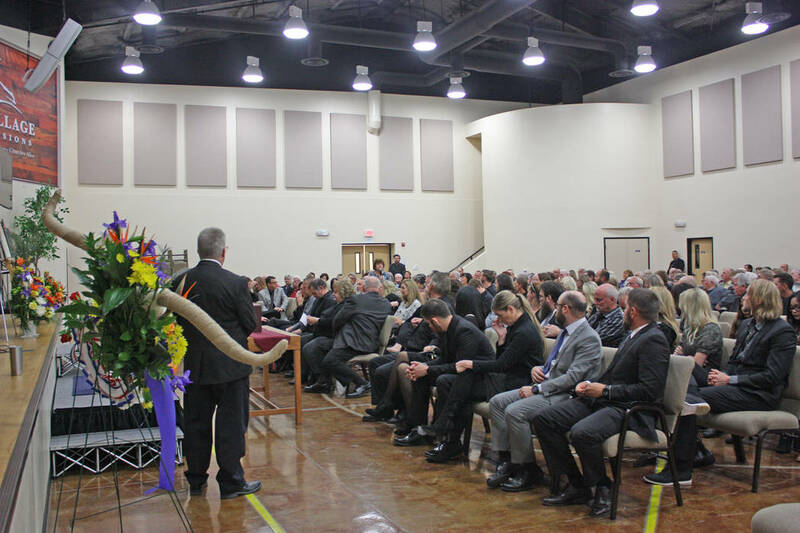 Robin Hebrock/Pahrump Valley Times Photos of Hollis Harris and bouquets of flowers lined the stage at the Celebration of Life hosted Saturday, Feb. 2 at the Pahrump Community Church. 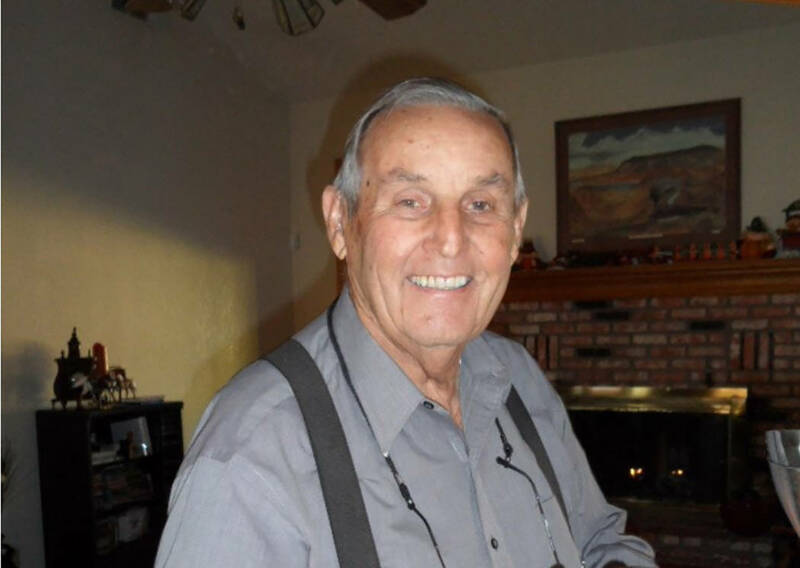 Submitted to the Pahrump Valley Times Hollis Harris died Jan. 19 at the age of 87. 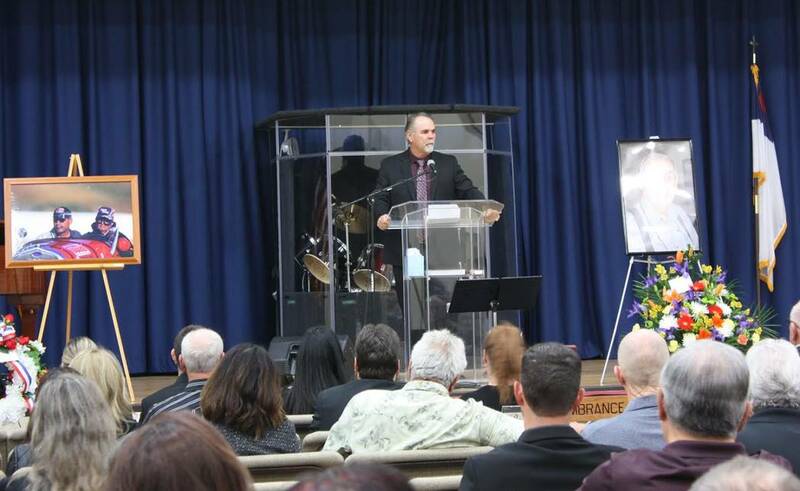 Robin Hebrock/Pahrump Valley Times Dan Harris is shown addressing the large crowd at the Celebration of Life hosted in honor of his late father, Hollis Harris. Robin Hebrock/Pahrump Valley Times Hollis Harris is pictured with his beloved wife, Joyce. Robin Hebrock/Pahrump Valley Times The Pahrump Community Church was packed with those who turned out to demonstrate their love and support for the late Hollis Harris and his family during the Celebration of Life ceremony. Robin Hebrock/Pahrump Valley Times Informal speeches were made by many of those attending the Hollis Harris Celebration of Life, with the microphone passed around to audience members so they could share a few words about Hollis, a man who will be very much missed. That was one of the most commonly reiterated themes at the Celebration of Life honoring the late Hollis Harris, who passed away last month at the age of 87. 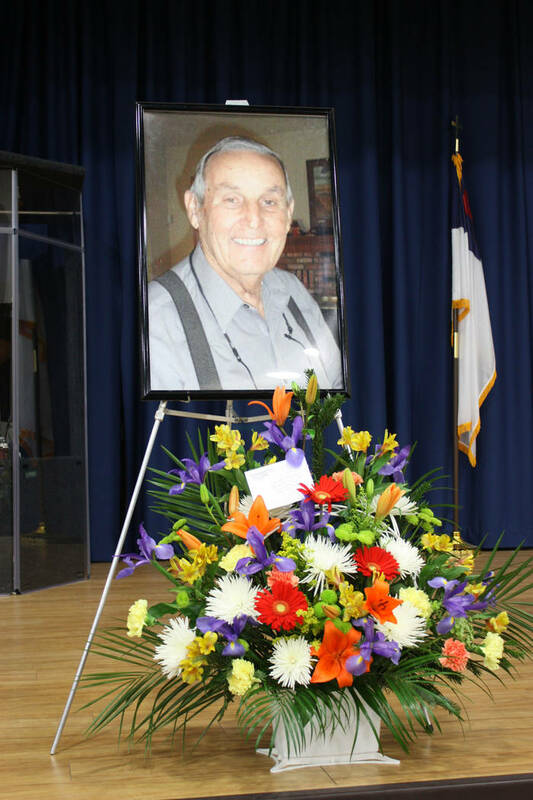 Though the event was rife with sadness, there was also joy and laughter as all those who knew and loved this pillar of Pahrump recalled his active nature, his humor, his bright, constant smiles and his ability to befriend so many. 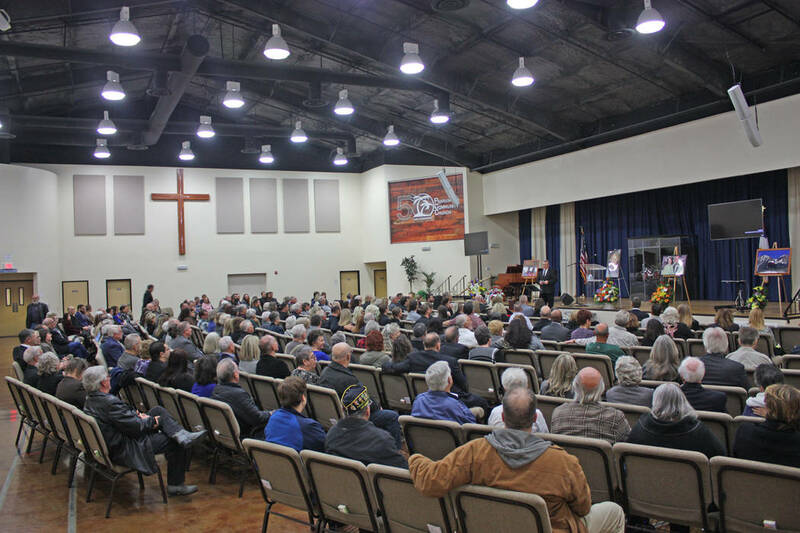 Hosted Feb. 2 at the Pahrump Community Church, the Celebration of Life drew a crowd of hundreds, filling the venue with the sounds and sights of remembrance and mourning. “Wow, what a crowd. I couldn’t be prouder to be up here to talk about my dad and we’re going to get through this somehow,” began Hollis’ son, Dan Harris, his emotions made plain by the tremble in his voice and tears brimming behind his eyes. Also obvious was Dan’s gratitude for the huge turnout as he thanked all those who came to show their love and support. Dan detailed the life of his father in his nearly nine decades, beginning Feb. 16, 1931 when he was born to parents Herbert and Pearl. Hollis had a large family with six siblings, all of whom passed before he did, including five brothers and a sister. After graduating high school, Hollis enlisted in the U.S. Air Force and he served two years in Korea. 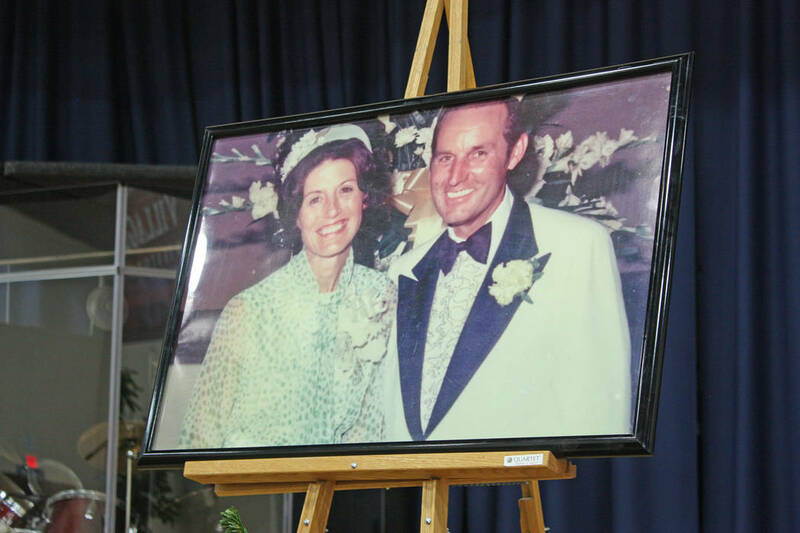 His last two years were served at McChord Air Force Base in Tacoma, Washington and this is where he met his other half, Joyce, whom he married in 1954. Hollis’ life journey eventually led him and his family to the Pahrump Valley. “In 1963 he moved Mom and I to Pahrump and we did not know what a Pahrump was,” Dan said with a grin, inspiring chuckles from the crowd. “We weren’t sure if we liked it or not but along we went. One of the early pioneers of Pahrump, Hollis continued to work in the farming industry. He loved to make things happen and for many years, farming was his one and only passion. Following Dan, many others took the opportunity to share their thoughts and memories of Hollis, little anecdotes that underscored who he was as a person and all of his loving, comical character, prompting even more tears mixed with laughter. At the end of the service it was clear that though Hollis is no longer with the community in body, he will remain forever in spirit and live on in the hearts of all those whose lives he touched.